Chant d’Arômes is a delicately rendered floral chypre, with a strong accent of peach and sweet orange. The inky richness of oakmoss and the milky sweetness of sandalwood serve as interesting contrasts to the pastel hued heart of honeysuckle and jasmine. It is at once innocent and alluring. 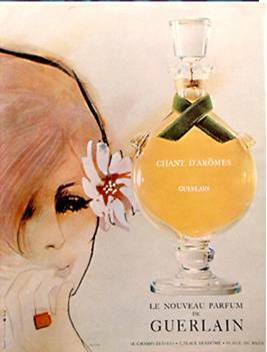 Chant d’Arômes has been reformulated numerous times, and today I like it much better than I did five years ago. It has a fresher, brighter quality than before, more similar to the original. The lack of oakmoss is felt, of course. However, it is overall a lovely retro chypre that should not be overlooked. My initial impressions are of herbarium, a collection of dried out blossoms carefully stored in heavy paper. A tinge of mustiness pervades the entire composition, and it drowns out its delicacy. On my skin, the eau de toilette does not reveal the dew-drenched florals I expected, and only in the parfum strength are the notes of jasmine, tuberose and honeysuckle obvious. Guerlain Chant d’Arômes includes notes of peach, bergamot, mandarin, tuberose, ylang ylang, helichrysum, gardenia, honeysuckle, jasmine, orris root, cedarwood, sandalwood, musk, oakmoss, frankincense, vetiver, and tonka bean. 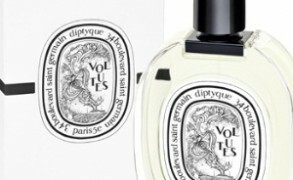 N aka parislondres: I miss the chant d’aromes parfum because the EDT is not at all what I remember. Hope you are well dear V! Hope you had a super weekend cherie. N aka parislondres: Dear Clearing! 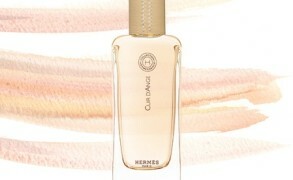 I will happily wear Chant d’Aromes parfum too – it is a really happy fragrance. ~clearing: N And V, those are sweet comments from two experienced sniffers. Sounds like N and I will wear it then ..and V, you can admire us from a distance. O: Or the other way around. JulienFromDijon: I spotted one old bottle on ebay germany (again!). It smells like orange blossom absolute corsed with the sour sweat of its female wearer. What comes closer now is “mandarin mandarine” of Serge Lutens (but more unwearable).